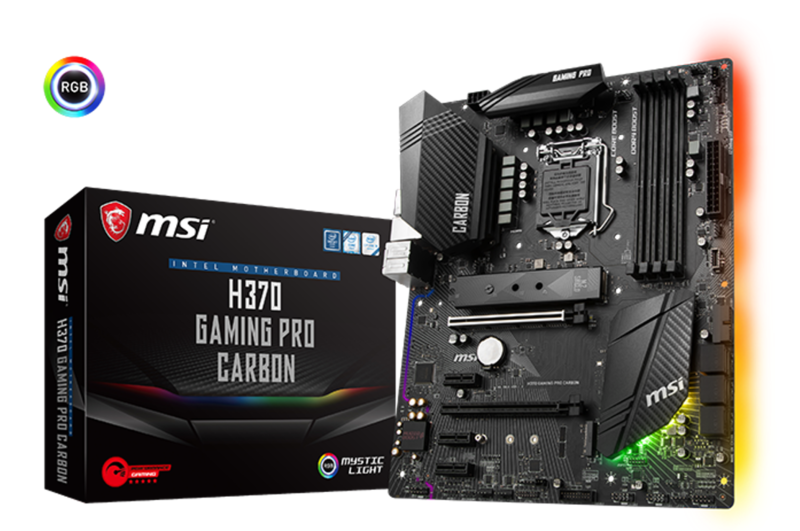 PERFORM IN STYLE: H370 GAMING PRO CARBON H370 GAMING PRO CARBON, with a unique and powerful extended heatsink design using concept car and CARBON elements, offers unlimited customization options by using MSI Mystic Light. In addition, the new H370 GAMING PRO CARBON also comes with plenty of new MSI exclusive features, tailored to give gamers the best gaming experience. Mystic Light Personalizing PC with 16.8 million colors and 17 LED effects using a smartphone, tablet or Windows PC, Mystic Light extends the unlimited RGB experience and is also supported by the world’s biggest hardware brands, such as Corsair, Cooler Master, Kingston and many more to ensure perfect synchronization of their RGB products, such as keyboards, mice, and headphones with MSI motherboards. Twin Turbo M.2 with M.2 Shield v2 Enjoy a blazing fast system boot up and insanely quick loading of applications and games with MSI’s Twin Turbo M.2 slots with patented M.2 Shield v2. M.2 Shield v2 is the M.2 thermal solution to keep the M.2 devices safe and cool to prevent damage and thermal throttling. Maximize your M.2 SSD performance with Twin Turbo M.2 and M.2 Shield v2. Intel Turbo USB 3.1 Gen2 Powered by Intel solution, Intel Turbo USB 3.1 Gen2 allows MSI motherboards to offer never before seen USB speeds with uninterrupted connection and more stability. Together with MSI exclusive X-Boost, your devices can be optimized for ever better transfer speed. BLAST AWAY THE COMPETITION: B360M MORTAR TITANIUM B360M MORTAR TITANIUM motherboards, combining military concept with titanium-scheme look and feel, provide stronger, tougher and heavier design with larger extended heatsink and solid components for excellent stability and reliability.